I’ve heard stories in the past of some hip hop superstar or other who started their climb to the top by selling copies of their debut recording out of the boot of their car. But until Christmas Eve, I’d never actually seen it happen in real life (and anyway, after so many years as a music journo, you tend to dismiss those stories as something the artists’ publicists made up). I had just landed in Atlanta an hour or two earlier, and hopped on the Metro Atlanta Rapid Transport Authority (or MARTA for short) train to Indian Creek station, where my cousin was going to pick me up. I was sitting in the station’s passenger pick-up/set-down area, minding my own business and enjoying the rare spectacle (for a Brit) of warm sunshine in December (they don’t call this place “Hotlanta” for nothing) when young a man came walking by, carrying a stack of CDs in clear plastic wallets. 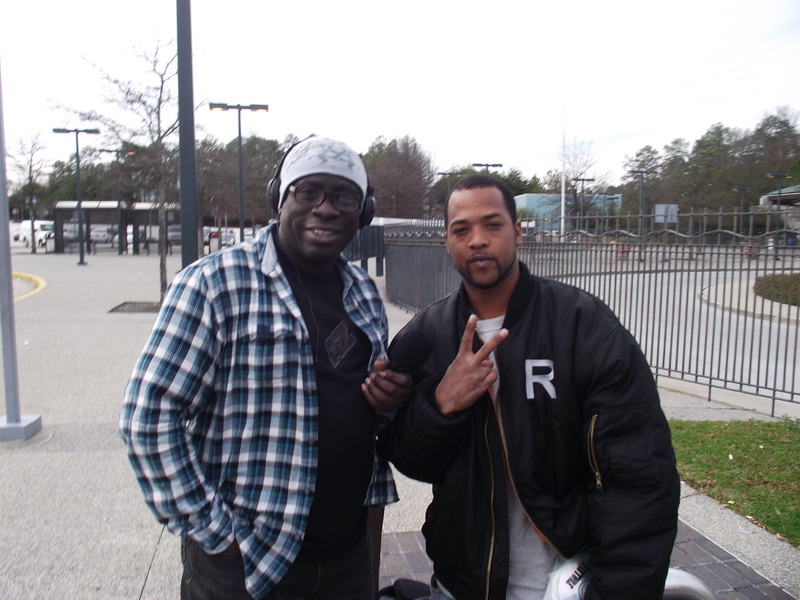 He stopped, introduced himself as Jamal – aka “Mally G” – and offered me a copy of his debut CD for whatever amount I was prepared to pay for it. I offered him $5; he gave me a CD, thanked me and wished me well and then went over to where a handful of cab drivers were waiting for fares and did his sales pitch again. And that was when I had a crazy idea: why not interview the guy? And why not? After all, I had my recording machine with me and I wasn’t going anywhere! And so I called him over after he’d sold a few copies to the cabbies. He came over; I explained what I wanted to do; we sat down and I got him to, as we say, tell me about himself. “That was a very nice thing you did,” said the lady who was sitting nearby waiting for her ride (and who took this photo of the two of us). Nice one, George! This is the real music industry, where the real creativity happens.